Where do most planets form? Do planets form in place, or migrate? How planets form is still a remarkably open question. We haven’t even figured out definitively whether planets formed in the places they are now, or formed in different places and then migrated to their present locations. A prevailing idea to date has been that the inner parts of solar systems—where our own terrestrial, rocky planets are—do not have enough solid material to form planets larger than about an Earth radius. To have enough solid material to form larger planets, the planets must form beyond the “ice line,” the distance from the star at which volatile materials like water condense to become solids. Since water is so abundant, you should have significantly more material available outside this distance, and planets like Jupiter and Neptune can form. In our own Solar system this theory hangs together very nicely! The little rocky planets are closer to the Sun, and big, gassy planets like Jupiter are all outside of where this “ice line” would have been in the early solar system (around 5 AU, Jupiter’s present location). But as we find more and more planets, the plot is thickening. The periods of planets are plotted against the mass ratio of the planet to the star (all on a log-log scale). 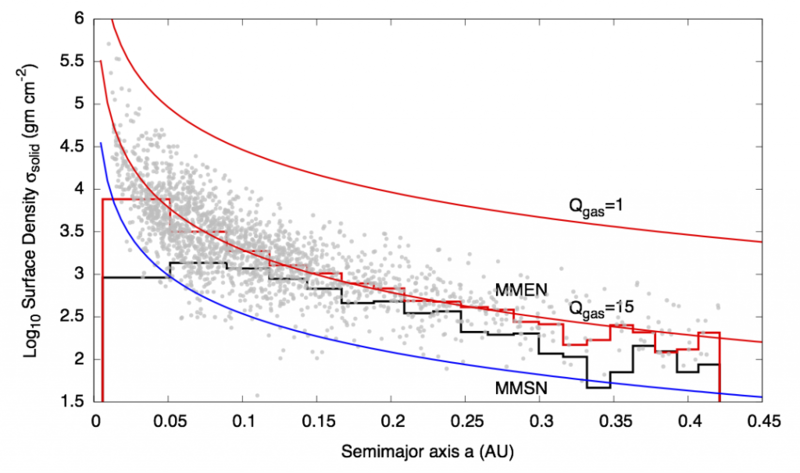 The satellites of giant planets in the Solar system are also plotted. Note that super-Earths, shown in grey, are a large, distinct planetary population. The Kepler space telescope has now found thousands of planet candidates, and the most abundant planets look nothing like any of the planets in our own solar system! 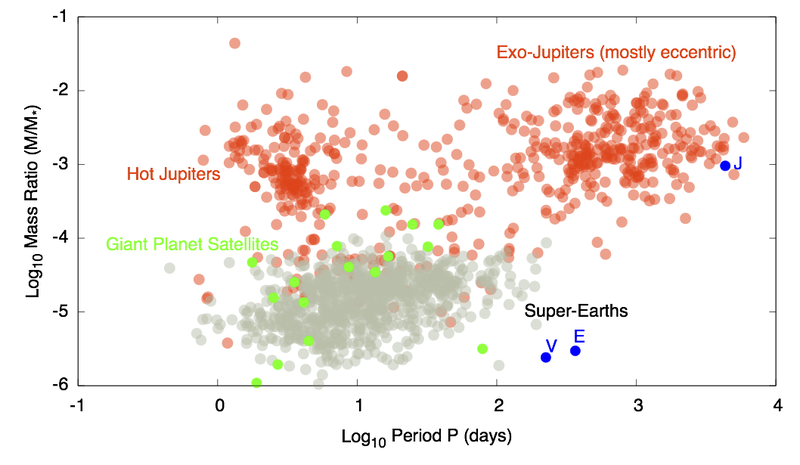 These planets are called super-Earths, are on relatively short-period orbits (less than 100 days), and are intermediate in size between Earth and Neptune (see Figure 1). These types of planets orbit more than half the Sun-like stars in the galaxy! In the current favored theory of planet formation, nearly all these planets would have formed beyond the ice line and migrated inwards over time to their current warmer locations. But what if we’re looking at the problem from the narrow perspective of our own Solar system? Our own Solar system may be the odd man out, since it does not have any of these seemingly ubiquitous super-Earths. Chiang and Laughlin’s work aims to shift the planet formation paradigm and explore whether instead of the mass migration process outlined above, super-Earths might have formed in their present locations. The minimum surface density of a protoplanetary disk to form the Kepler super-Earths is plotted (lower red line, fitting the point)*. The minimum disk surface density for our own Solar system's protoplanetary disk is shown in blue. The surface density at which the disk would be unstable is shown as the upper red line. To form all these planets in place, a more massive starting disk would be necessary—about 5 times more massive than the one we’d need to form the planets in our own solar system. (See Figure 2). Super-Earths should form quickly, before the gas in the disk has disappeared, which happens about 1-10 million years after the star first forms. Super-Earths accrete some gas from the primordial disk, which most could probably retain over their lifetimes. This would explain their radii, which are larger than purely rocky bodies like Earth. Overall, this new paradigm for planet formation is quite plausible and warrants further, more detailed study than the order-of-magnitude treatment of the paper. It’s also testable: the authors make some tangible predictions for the future. Among their predictions are that A and B stars should lack close-in super-Earths because they’re too hot for dust to survive to make planets, while brown dwarfs and M dwarfs should have small planets around them. Orbits of super-Earths should be aligned with the stellar spin axis, and these planets should have H/He-rich atmospheres. * Surface density is just mass divided by area, and is the analog of regular density for items of which we observe 2-d projections. How to Build a Low-Density Super-Earth Do planets form inside-out? Recap of the IAU Planet Formation Symposium Are Carbon-Rich Planets Just an Observational Bias? This is quite an interesting take on how these planets get to where they currently are around their stars. My question(s) are biological as well as investigative. Following this model, what might the impacts on potential life be? Not just the little green men type of life, but vegetative as well? Would these planets continue to travel inward and eventually into the sun or could these planets potentially break the gravitational hold from the star and continue their roaming throughout the universe? (I’ve heard of rogue planets and stars traveling through space in class before) That being said, once an atmosphere has taken hold on the planet, and plant-life has started (hypothetically of course), what is the possibility that the life there could be transported from one solar system to another, possibly giving rise to life on another planet in another system from a glancing blow from a foreign body making impact, or from collision w/ another planet? And lastly, is there anything that an amateur astronomer like myself can do to help with this investigation? Hi Caroline! Thanks for writing this. Is the abundance of hot Jupiters and Neptunes due to any sort of bias in the Kepler data, as they may be easier to detect than rocky planets? I’m impressed with how far this field has come in the last five years since I took my first class on exoplanets with Sara Seager.